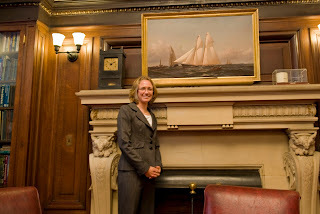 I was fortunate enough this year to be invited to the US Sailing Rolex Yachtsman and Yachtswoman of the Year award luncheon in New York City. The Rolex award is given annually to a male and female sailor who are deemed to have the most outstanding individual achievements on the water within the calendar year (2009). 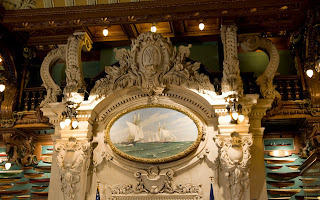 The ceremony is held at the New York Yacht Club, which is a beautiful venue. 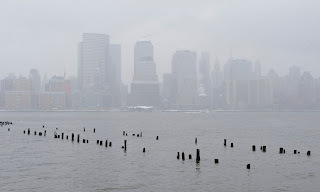 The NYYC is probably the only sailing club in the United States whose main clubhouse, over 100 years old, is not on the water, but is instead situated in the middle of Manhattan (44th St). Much of the yacht racing and sailing history of the United States involves this club, starting with the yacht America, the vessel the America's Cup is named after, and many, many America's Cup campaigns. Since the NYYC is so historic, and the Rolex awards an important event, I didn't want to miss it. However, the craziness of this winter still has a hold on the northeastern United States, and my mom and I drove up from Annapolis in flurries of snow. As we got closer and closer to the city, the snow came down hard. The next morning, we had to dig the car out of the parking lot of our hotel in Jersey City. The plows had been working all night, but much of the city was still buried under a foot and a half of snow. On the way to the ceremony, we drove around cars and delivery trucks spinning their wheels in attempts to un-stick themselves from the snow. When I walked into the club, I was escorted up the stairs into a room that made my jaw drop. 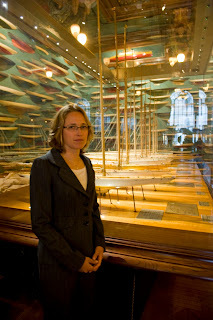 Every inch of the walls were covered by half-hull models of boats. The first thing I did was walk a lap and stare at all the boats. 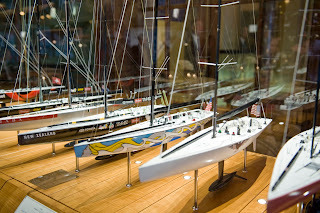 Sizeable display cases held to-scale models of all the America's cup challengers and defenders. The BMW Oracle trimaran and Alinghi catamaran should make interesting additions, as they will take up twice the space of the monohull models. Ornate wood carvings and a massive mantlepiece completed the room. We also got to take a look at the extensive and stately library (the shelves and layout of which looked virtually unchanged since the 1900s) and trophy rooms, including the room where America's Cup trophy was historically kept. This year's recipients of the Rolex award were Anna Tunnicliffe and Bora Gulari, who each received a beautiful watch. Gary Jobson, President of US Sailing, gave a speech and whimsical video presentation showing childhood photos of the two sailors. Dean Brenner, Chairman of the Olympic Sailing Committee, and Charlie Leighton, the Executive Director, presented the awards. It was fun seeing the high-profile NYYC members, sailors, and US Sailing officials enjoy the afternoon. Congratulations to Bora and Anna! Afterwards, my mom and I had fun walking the city at night. The snow was still falling a little, creating an in-the-moment atmosphere. To top off the evening, we caught a performance of Wicked, a musical set in Oz depicting the life of the Wicked Witch of the West before she was melted by Dorothy. It was quite a New York experience. Altogether, our trip was successful and an interesting vacation. It's good to be the occasional tourist. As the northeast United States gets buried with snow, Florida is experiencing relentless cold fronts. If you're coming down to get warm, forget it. The most you can expect is not to have to wear your snow boots....just your thickest wetsuit, and so we all did for Mike Rayl's Frostbite Series regatta in Melbourne. Mike is a local guy who sails and promotes the popular Exocet Kona one-design longboard, driving around to events in a rusty 1980s VW van stacked with Kona gear. The Kona is a fun class, and Mike is a fun guy. His regatta day is very informal and relaxed, a gathering of friends to partake in a small weekend adventure. The venue is a bar titled "Squid Lips," which happens to have a little beach and some sweet heat lamps on the deck. Temperatures were in the low 40s as the windsurfing vans slowly trickled into the parking lot. The wind was classic cold front conditions, northwest with big gusts anywhere from 8-20 knots. As we didn't have a boat or marks, we used channel markers with Mike running a rabbit start for the six Formula racers who showed. The Konas raced after us. The starting area, next to the SR 518 causeway, was extremely choppy. Waves were going every direction possible as the wind-driven chop reflected off the seawall. Not only was the chop bouncing everywhere, so was the wind, as it was forced to lift over the rise of the bridge and causeway. Therefore, the starting area and the leeward mark (a big, square minimum wake zone marker) had less wind and big wave action, making it a difficult place to maintain speed and control. The course was overall very challenging. Near each shore was a big lift, but the left (west) shore was the moneymaker. However, to get over there, we had to sail through the backwash and a couple big headers. I had a good start on top of the rest of the fleet and gained some height in a few big puffs. Initially, Peter Ifju was ahead, but tacked out to the right too soon to gain the major advantage from the left side. I went in as far as I could to the shore without getting into the wind shadow and rode a few nice gusts up to the windward mark. Frenchman (living in Jacksonville) Vincent Barre used the same strategy and we rounded the windward mark together. I started to lose him on the downwind to his superior angle and speed. Although we were still in contact when we rounded the leeward mark, Vincent was able to navigate the difficult chop better and I lost him early in the second upwind. The wind had started to die and many sailors were having difficulty in the huge holes. I held on to my lead and finished second. After the race, the Formula sailors decided to have a big training session. We were a little frozen, but the sun started to peek through the clouds, inspiring us to go back out. I worked with Peter a little, and was a gauge for him for tuning up his new Mike's Lab board. It was his first time sailing it, and some of his speed issues were related to the unfamiliar board. After a couple hours, Peter had his gear going faster and I was feeling really dialed in to the puffs and lulls. It was a chilly but fun and productive day for Formula and Kona sailors alike, and a great success for the race series. I'm hoping for another chance to compete at a Frostbite regatta. A breakthrough regatta isn't necessarily about seeing yourself jump up in the results, but rather know and feel that overall you've been racing really well. For me, the Miami OCR was this regatta. After a few months not sailing RS:X and focusing on Formula (and some rest too!) it was good to come back to the board and realize that I had made some big gains last year during all the training and regattas. As the fleet overall gets better, it's sometimes hard to see that you're getting better too, until you realize that you're actually racing and not just "following the leaders." Overall I had a pretty solid regatta. My speed is getting better and I'm improving a few things at a time in that respect. If I had a bad upwind, I made up ground on the reach, which is a technical ability I've never had before. Improving reaching made racing through the slalom section a lot easier (also, my jibes are a lot better from Formula training). This was the first regatta where I actually felt competitive in the slalom, and in a few instances overtook a few sailors around the turns. The most interesting aspect of speed is that it completely rules boardsailing. Although being fast with bad tactics won't improve anyone's standings, the simple truth is that speed is what separates the front of the fleet with the back. Sailors who are fast can get out of bad situations a lot easier than the slower sailors. Also, faster sailors have an easier time executing a tactical plan. They are able to get off the starting line faster and get to the side of the racecourse where they already planned to go. For example, I can create a good plan for a race and perform a good start, but if lots of faster boards get ahead of me before I can execute my plan, I may have to bail out just to get clean air. 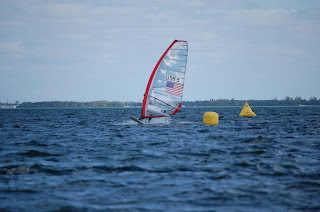 In many instances, I have seen fast sailors have bad upwind legs, but make up ground so quickly on downwind legs that they completely save their race. My focus for the season is to make more technical improvements so my speed gets much better. This will come with very organized training and coaching, and one of my goals for this week is to put together a very good training plan. Of course, that includes working on the dreaded budget, weighing the value of new equipment versus travel, coaching, and training, and trying to manage debt. I'm ranked first again for women's windsurfing on the US Sailing Team Alphagraphics (that's the team's Gold-level sponsor). It's good to be back and I'm very encouraged not only by my own performance at this regatta, but also the way the team is shaping up. The team is smaller than ever this year, but in that way we will be able to focus our resources more efficiently. Once again the boards will have a coaching budget, so we will have some coaching at a few regattas, which is extremely helpful. Our team leader is enthusiastic and excited about our plan this year, and is very happy with how the team is performing overall, especially with the OCR performances of some of the developmental sailors. Later, we will also be suited up in some new gear from our clothing sponsor Atlantis so that we all look unified. The new team culture is very positive, but what the boards are really lacking is a US Sailing-run developmental program like the boats have. As more juniors come through the US Windsurfing programs, there will soon be a need for it (I'm thinking in the next 2 years). Hopefully, as the US Sailing Team's overall results improve and the PR program matures, there will be funding for such a project. Boards are the easiest class to develop, as proved by the Polish team, whose youth team makes good results with not very much money. Coach Mike Gebhardt helps teammate Lisa Kremer tune her rig. I'm looking forward (as always) to making some big improvements this year. 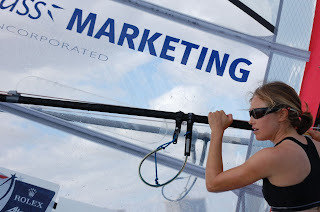 Thanks to my great sponsors, Compass Marketing and KA Sails, for helping me achieve my sailing goals.